This photograph was taken in 1940, the .49 in the corner was used for cataloging purposes by the photographer Helen McCall. You might also enjoy this historical video vignette about Frank Sully below! The Sunshine Coast is located on the southern coast of British Columbia, Canada, between the entrances to Jervis Inlet on the northwest, and Howe Sound on the southeast. The rugged mountains bordering these inlets cut it off from direct road connection to the rest of the province, so although part of British Columbia's mainland, it depends on ship or air transportation. The Sunshine Coast's 86 km of coastline is home to a variety of small tight-knit communities extending from Port Mellon to Egmont. The largest population centers are located in Sechelt and Gibsons, and although the Sunshine Coast is part of the BC mainland, it is only accessible by sea or by air. The naming of "The Sunshine Coast" originated with the pioneer family, the Roberts of Roberts Creek. In 1914, Harry Roberts painted "The Sunshine Belt" name on the side of the freight house on the first wharf built in Roberts Creek, and the the name was apparently used to promote Roberts Creek as a summer resort destination. When the Black Ball Ferries started a car ferry service to the coast in 1951 they started using the term "Sunshine Coast" to promote the whole area from Port Mellon to Pender Harbour, and the name quickly became popular. For thousands of years the region we call the Sunshine Coast has been home to the Sliammon, Sechelt, and Squamish peoples and is still considered the traditional territory of these nations. It was first visited by Europeans during voyages of exploration in 1790s, and much later in the 1870s began to be selectively logged by crews from the Moodyville sawmill near Vancouver. Settlement by Europeans and other non-native peoples began in the 1880s, with fishing and logging being the main occupation of the settlers, along with small scale farming mostly for their own subsistence. Three main settlements grew up in the following years: Pender Harbour, Sechelt, and Gibsons. These, and other smaller communities, were at first isolated from each other by the mountainous countryside, and depended on coastal steamships for transportation between each other and Vancouver. 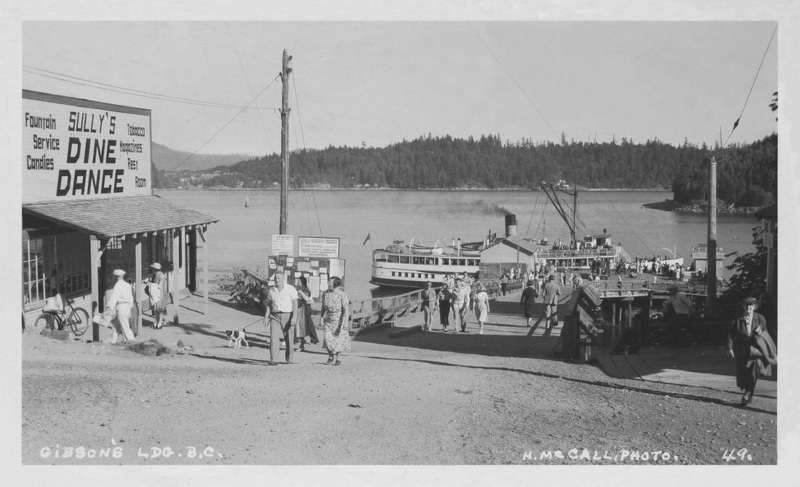 The development of the highway, which reached Pender Harbour in the 1930s and the northwest end of the Sechelt Peninsula in the 1950s, brought the settlements closer together, and after car ferry service began in 1951, closer to Vancouver. After this date, the population increased rapidly, as it continues to do until this day. The old traditional industries of fishing and logging are now outnumbered by service industries and the various professions, as we become ever more closely connected with the rest of British Columbia, Canada, and the world.